The Knowledge Capture app is available in Zendesk Marketplace if you need to install it again for some reason. Apps and Zendesk Marketplace are not available to users on the Support Essential plan. In Zendesk Support, select Admin > Apps > Marketplace, then find the Knowledge Capture app and click the icon. Alternatively, go directly to https://www.zendesk.com/apps/support/knowledge-capture. On the Installation page, enter a new Title, if you'd like. (Guide Professional and Enterprise only) Allow agents to create new articles enables agents to use the app to create new articles using a pre-defined template (see Creating articles). (Guide Professional and Enterprise only) Allow agents to flag articles enables agents to use the app to identify existing articles that need updates and add inline comments (see Flagging articles). Show in ticket editor shows the app in the ticket editor. You can choose to display the app in both the editor and the apps panel. For tickets from social channels or markdown tickets where the rich text editor is not available, the app will be available in the sidebar app location. Show in the Apps panel shows the app in the apps panel in the ticket sidebar. Auto-select brand for search enables the app to search the Help Center of the brand set on the ticket. When deselected, the app searches the Help Center based on the agent's last selected brand in the Knowledge Capture app. 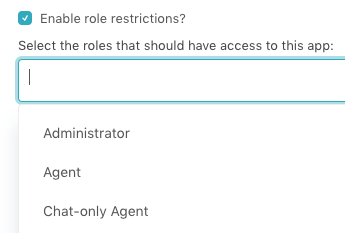 Click Enable role restrictions if you'd like to limit app access to specific roles, then select a role. You can select multiple roles. Click Enable group restrictions if you'd like to limit app access to specific groups, then select a group. You can select multiple groups. The Knowledge Capture app is added. To start using the app, see Opening the Knowledge Capture app. Workflows for created and flagged articles (Guide Professional and Enterprise). Hi Jennifer--I signed our organization up for this early access program and we are looking forward to using it. Do you know when I can expect to be added to the program and be able to install the app? Thank you! Thanks for your interest and for signing up! I am not sure of the timeline for adding more accounts to the early access program. I'll check with the product manager and find out! + 1 on looking forward on using it! I just got the access to the program and that was quick! Cheers for that. I still have a question. Is that so far only available in English? Currently you can only search for articles in the same locale as your Help Center. This means, that you cannot use the app to search for any translations other than the default locale for your Help Center. Learn more and participate in the beta community here. We just got access to the EAP. I can't seem to figure out how to install the app. Is it in the marketplace? Sorry about that. The instructions were accidentally overwritten. They are in the article now. In Zendesk Support, click the Admin icon ( ) in the sidebar, then select Apps > Manage. Remove /manage from the URL. Click the Zendesk Apps Beta section on the right or Search. How does this new app differ from both Answer Suggestion & Ticket to Help Center apps ? How do I get list of Tickets where Article is Linked? What kind of different reports/views can be made for tracking the use of Articles and Tickets with/without articles linked? I have the same question as Kunal: if we want to have a metric for # Tickets where Agents used Knowledge Capture, how can we do it? I'm trying to access the link for "edit the Knowledge Capture app settings" (https://support.zendesk.com/hc/en-us/articles/360000654228) in step 5, but I am getting a message that I'm not authorized to view the article. Any ideas why I would be able to read this article but not the linked article? Oops, sorry about that! It's fixed now. Please try again, Kirsten. Thanks! Jennifer - it works now. Thanks! +1 to Kalle Windefalk comment. Our use of the knowledge base is internal only, meaning we'd like to insert the actual text of the article and not a link. I thought this was possible with Knowledge Capture App but I guess not. Does anyone have an alternative solution to simply copying and pasting text? The Knowledge Capture apps seems to bring our Zendesk users in Internet Explorer v11 to a halt. Opening up a ticket takes several seconds and the entire system freezes during that time - basically making it unusable. Users of Chrome are working OK.
We've had to disable the app due to the complaints from agents. Does KCA only work for ticket titles or can it also read text bodies? The KC App searches the ticket description, which includes the subject and the first comment. Hope that answers your question, but let us know if not. Which Guide plan are you on? One of my colleagues just pointed out that on Guide Lite, the search results are pre-populated based on a search of the ticket subject. Whereas on Professional and Enterprise, the search results are pre-populated with Answer Bot-powered article suggestions, based on the requester's most recent comment. Do you also have Answer Bot enabled? No we have not. At the moment our Zendesk HelpCenter (Guide) is also not live yet, does that have anything to do with the fact that it only search within ticket titles? Thanks. Yep, both of those factors would impact this functionality. You need a live HC in order for Answer Bot to be operational, and Answer Bot is what powers the article suggestions based on comments. Do you have more information about if this will work for our legacy pack? Be set up to receive English-, Spanish-, or Portuguese-, French-, or German-language tickets"
and the KC App is available for every plan except Guide Lite. So it should all work once you get everything up and running! Am trying to set up templates for Guide and have just tried to add Knowledge capture. I've added my zendesk domain and then when I click "Login" nothing happens. Presume I'm doing something wrong? Apologies for the delayed response on this post! I did want to inform you that this issue has been resolved by our internal team.